April 12, 1980, Terry Fox embarked on his cross Canada run on one leg called the Marathon of Hope to raise money for cancer research. Terry Fox statue in front of the Centre Block Tower at noon. See the Canadian Parliament collection at mostphotos.com. The Lion and Unicorn gargoyles at the entrance of Parliamentare symbols of the United Kingdom. They are part of the Coat of Arms of Canada since 1921. The Lion stands for England while the Unicorn stands for Scotland. The traditional legend of enmity between the two heraldic animals is recorded in a nursery rhyme. 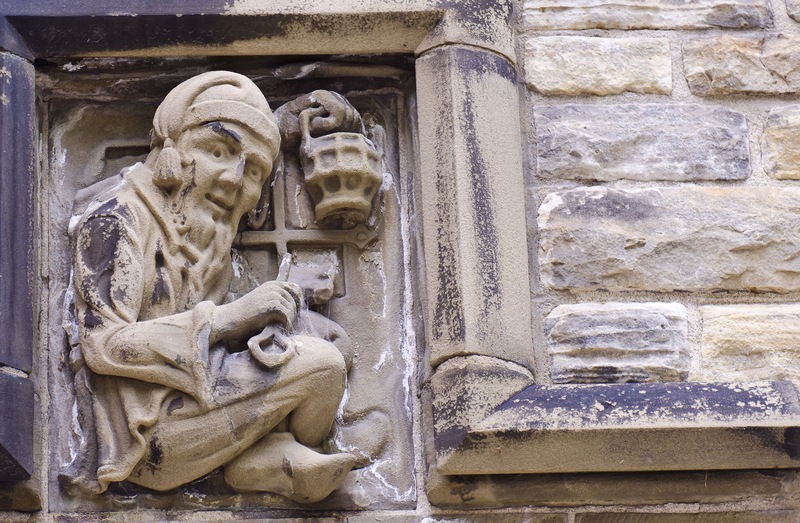 Four of the many grotesques that can be found in the gothic architecture of the Peace Tower are made from Wallace sandstone from Nova Scotia, Canada. They are each approximately 42″ by 22″ wide. They remind me of certain scenes in the Batman movies. Here is a closer view of one of them. Also, note the tourists looking back at us from inside the observation deck. Interesting! These grotesques are seen half-way up the clock tower. One is hooved and playing the lute, the other must be the town crier. It gives the feeling of a mysterious gothic presence on Parliament Hill. More grotesques, on the right, kneeling and holding a bow, while his pig-like friend is playing the accordion. Note in the centre of the tower, a soldier holding a rifle. Just beautiful work. You can also see more sculptures just above eye level, along the main Parliament entrance. Have a look at these pretty faces. We see fictitious people, lions, dragons and owls. This interesting character belongs to the Justice building. He’s holding a lantern and a key; perhaps to a secret room! Here, we see the Unicorn gargoyle profile looking to the East and Langevin blocks. 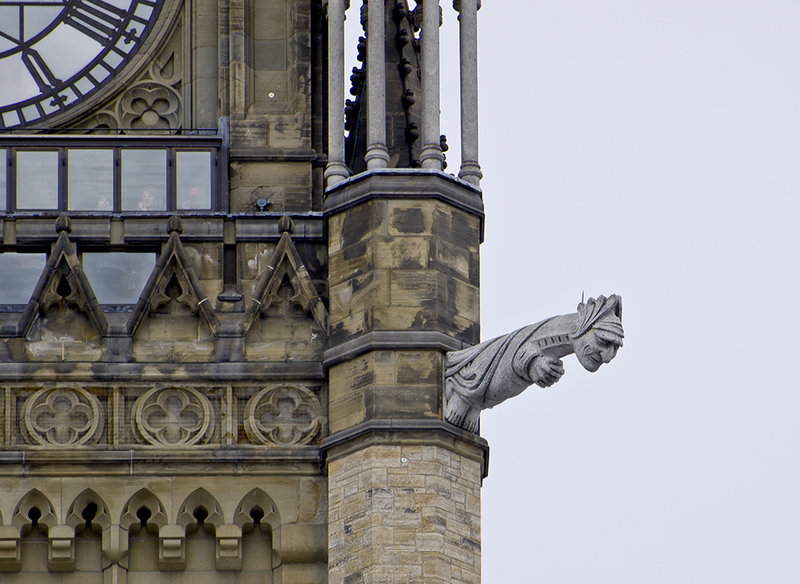 When all is counted, approximately 370 gargoyles, grotesques, carvings, friezes and bosses can be found on the Peace Tower. I Hope you’ve enjoyed a quick look at some of the gargoyles and grotesques. There are many more carvings and sculptures to see all around the Hill and a visit is a must. Meanwhile, see the Canadian Parliament collection of more than 200 photos of our beautiful gothic architecture. Images start at $12 and are available for immediate download. Also, have a look at the complete Galleries with categories such as people, animals, colors, seasons, Christmas and Ottawa. I’m Michel Loiselle, Graphic Designer/Photographer from Ottawa. I’ve been capturing our Canadian Parliament digitally since 2006. The collection took 7 years to complete. (Part-time, while working at the House of Commons on the Hill). It was evident from day one that this Parliament had many faces and personalities. Because of its configuration and architecture, you get a different view whenever you change angles. Here is the view most tourists see from the main gates on Wellington Street in Ottawa. It’s a great view! Moving north across the river to Gatineau will give you a totally different Parliament with the Library and the Royal Alexandra bridge. It’s fantastic! This photo, Bridged Parliament, taken during magic hour, also features the World Exchange Plaza with its original ball clock on the roof. From the east side during fall, yet an entirely different view of Parliament Hill. Every angle and season offers something new. I photograph Parliament year-round and am thankful for the experience. There’s something about taking your time with a photo while listening to mellow jazz on the iPod and giving in to the beauty. The gothic architecture simply takes me away every time. Again, we cross the river at night with a full moon to see the true spectacle that is our Canadian Parliament. I hope you’ve enjoyed your visit on Parliament Hill, and please drop in and see the 200+ Canadian Parliament collection of images on sale at mostphotos.com. The collection includes Canada day, Christmas, Inside, Silhouettes and Seasons. Images start at $12 and are available for immediate download. All files are quality checked for color accuracy and are noise-free.